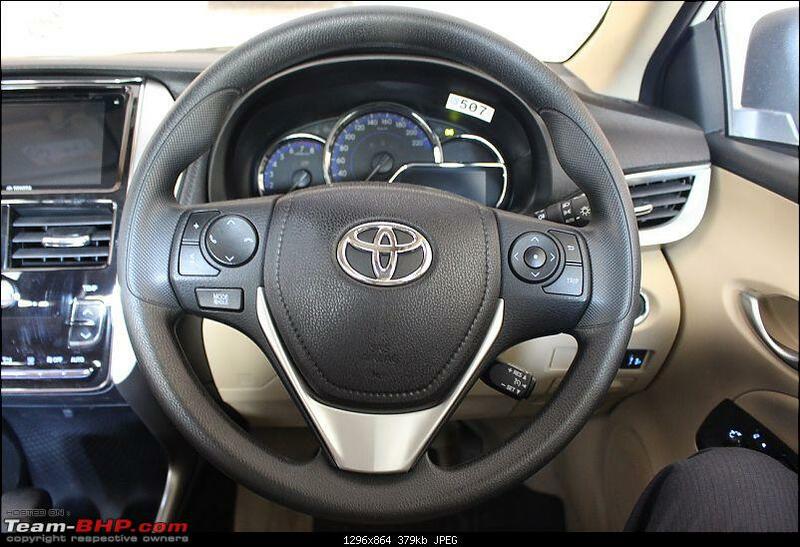 - Smooth CVT with sufficient power to cruise all day long in 3 digits. Automatic option available across all variants. - Pricey. They should have priced each variant at least 50K less to take on competition. 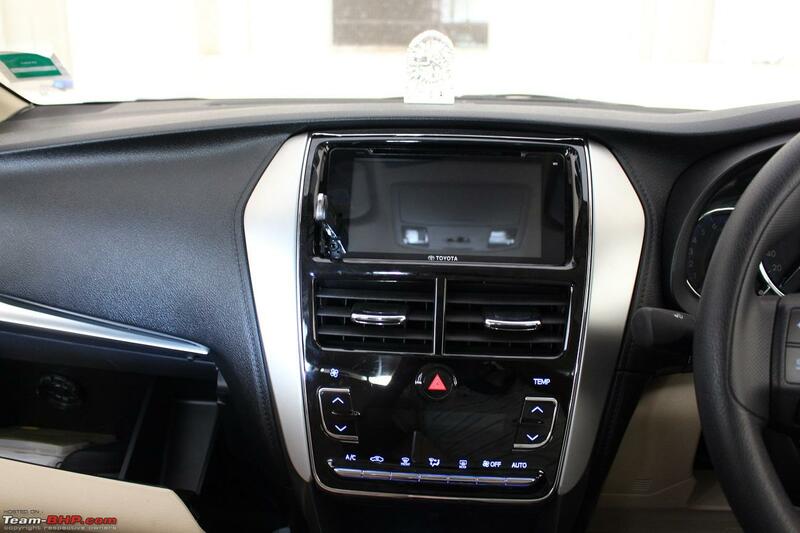 - Missing features like dead pedal, proper armrest, sunroof etc. 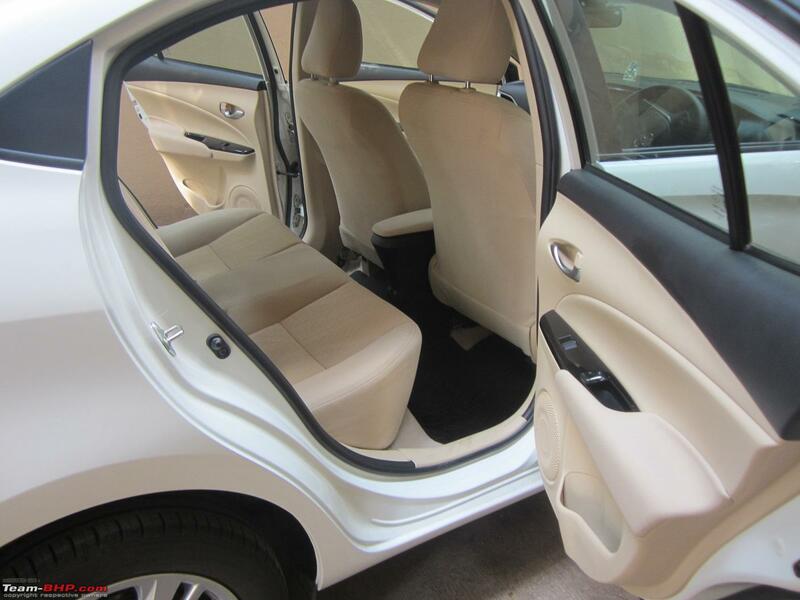 - Beige interiors is hard to maintain and would have preferred all black interiors. - Over-styled face. 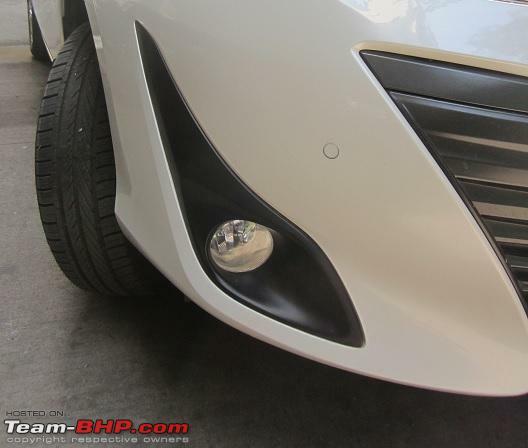 I still love the arrow shot design face of 3rd Gen Honda City. Last edited by Simhi : 2nd December 2018 at 07:13. Last edited by Simhi : 28th November 2018 at 09:30. One of the main reasons for buying i10 was to go for Automatic so that wife could drive the car within city limits with ease. However, reading through various threads made me realize how I had overlooked the safety aspects while buying the i10. It had no Airbags and neither ABS. ESP was out of question. I usually hold the car for more than 5 years and by 2015 made up my mind to switch to new car by giving priority to safety features. At the same time, the kids were growing up and we were ready to go on long distance drive and the safety aspect was constantly at back of my mind. In 2015, I had almost landed up buying Honda City but looking back I feel happy that I postponed the decision as I would have landed up buying car with dual airbags. Last edited by Simhi : 2nd December 2018 at 07:14. 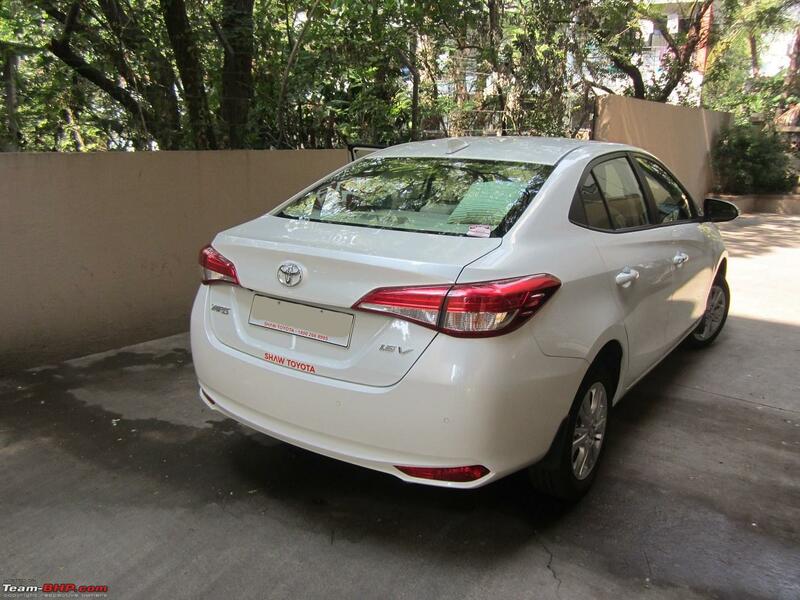 We had started making long trips in i10 like visiting Ganpatipule, Shirdi etc. However, for a family of four, we found the boot space inadequate for our luggage and sometimes had to keep bags inside the car and travel. Also, with safety aspect constantly bothering me, we finally took a call to sell the car in 2018. It had clocked 21K kms in 8 years (mostly city driving). Based on my previous experience of selling Santro, I put advertisement in few organizations through friends but the response was very poor. We had by then started short-listing vehicles and were taking test drives too. 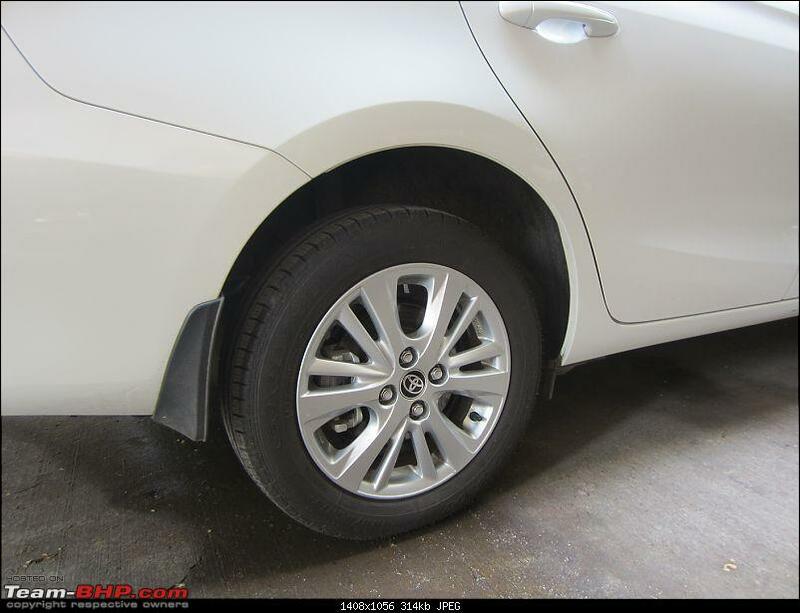 Toyota dealer offered the worst buyback price. 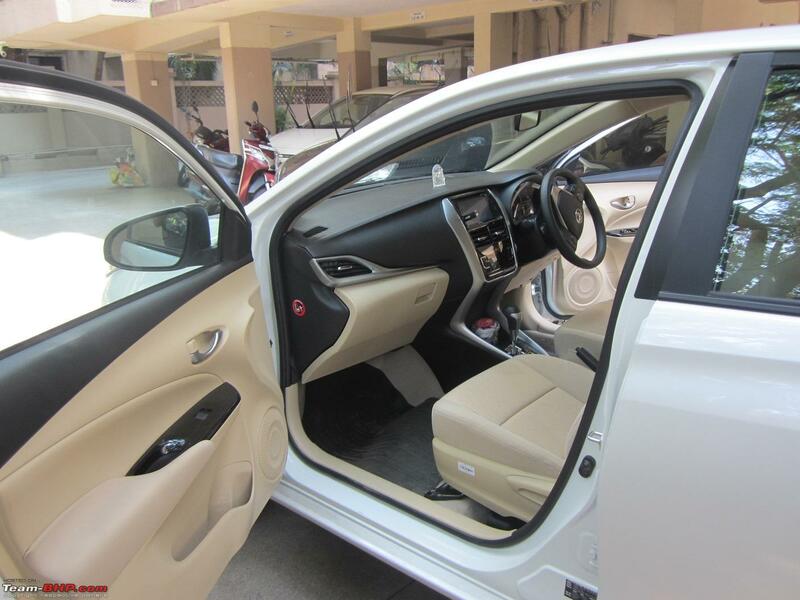 Hyundai dealer price was very competitive but insisted on purchasing Hyundai vehicle for smooth transaction as well as for availing exchange offer. I had read mixed reviews of Cars24 in our forum and wife suggested giving them a shot after looking at various TV ads. The online price quote of Cars24 was very less. Nevertheless, I took an appointment and visited them on a working day. The whole process of inspection and bidding took one hour. However, I was surprised with the price offered as it was around 30K more than what the Hyundai dealer had offered. I took the bait and agreed to sell the car on the spot. Cars24 held back 20K and paid remaining amount within an hour. The 20K was held up for verifying service history. I was a little apprehensive of the same but with constant follow-ups, the remaining 20k was transferred the next day. Maybe, I could have got a better price if I had sold directly to an individual but I liked the hassle free transaction with Cars24. I verified the details of i10 car after a month and it had got transferred to a person within PCMC limits. Overall, my experience of selling car with Cars24 was good. Last edited by Simhi : 27th November 2018 at 04:26. However, I was disappointed when it was finally launched in India. The Petrol AT was not available in SX(O) variant and therefore only 2 airbags were available with petrol automatic variants. We still had a look at the vehicle but wife and kids rejected it immediately after sitting at the back as the window was very small and rear was claustrophobic. Still, we had a pinch of hope that Hyundai would address the safety aspect with the facelift but were disappointed once again. I still can't understand Hyundai's logic of not providing 6 airbags with top most petrol automatic variant. It was finally ruled out. Verna is value for money. Nothing wrong with Verna 1.6 SX(O) Petrol Automatic. 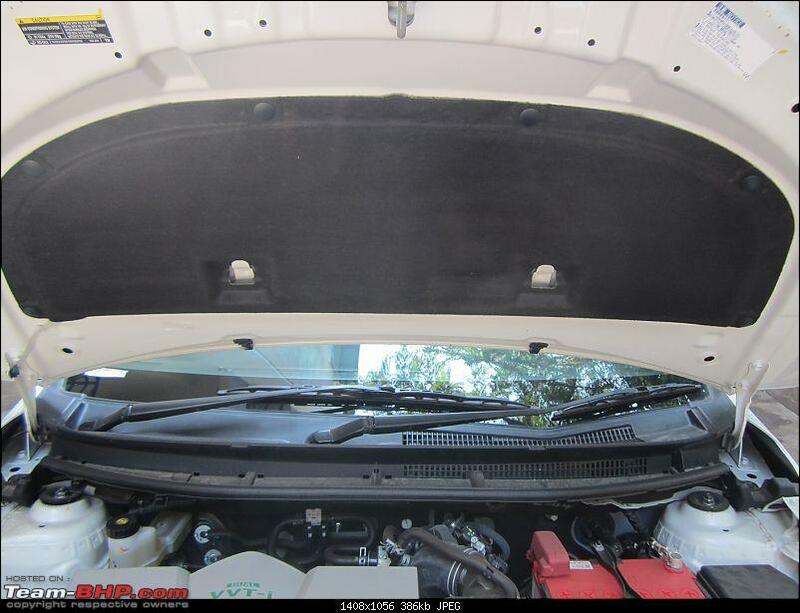 You get everything including a reliable Torque Converter unit. However, we wanted to hold the next car for 10 years and were leaning towards Honda or Toyota brand. We have been a loyal Hyundai customer for last 16 years and virtually have no complaint with the company or dealer or their cars (Santro followed by i10). We took test drive of Diesel automatic. As compared to i10, the power was linear and pickup was good. We wanted to test drive Petrol automatic, however, the dealer could not arrange for it. Anyways, we did not do follow-up as by then we had decided to go for Honda City or Yaris. A car still a favorite of my wife (brand, looks, spacious feeling) and kids (Sunroof). The dealer experience was very good. I don't remember how many times we took the test drive and each time the dealer was eager to provide car and support our queries. Only ZX variant fitted our criteria. The engine was powerful, though NVH was very poor. 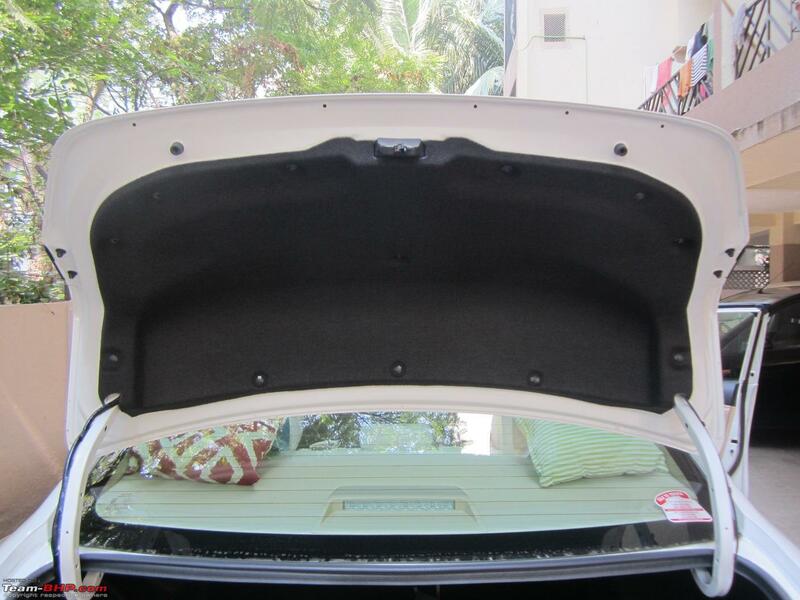 The car was loaded with features like LED headlamps, Sunroof, Leather seats etc. Honda should consider providing 6 airbags in lower variants too starting with VX. Even after discounts (Rs.1 insurance + corporate discount), the car was almost 1 lakh above my budget. Also, various posts related to Niggles and Honda quality made me think twice before going in for Yaris. It was a tough call between Yaris G/V and City ZX but Yaris won at the end. 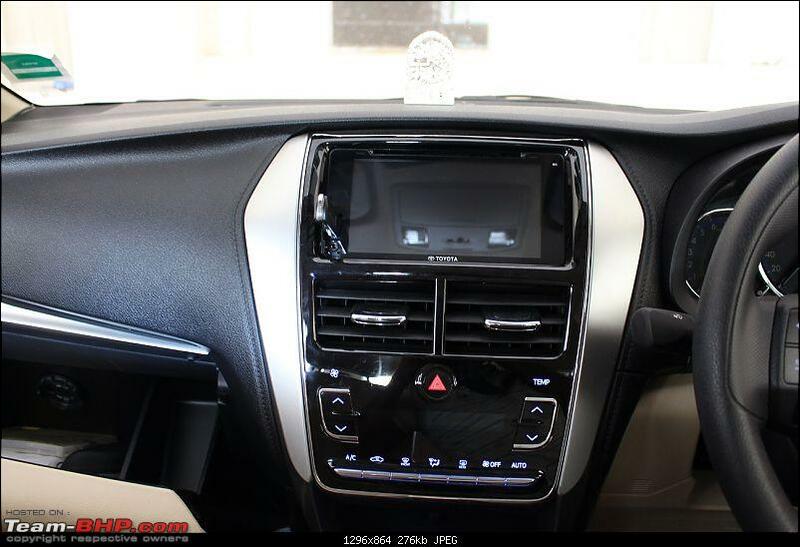 The main selling point of this car for me was the safety features - 7 airbags + ABS + EBD. 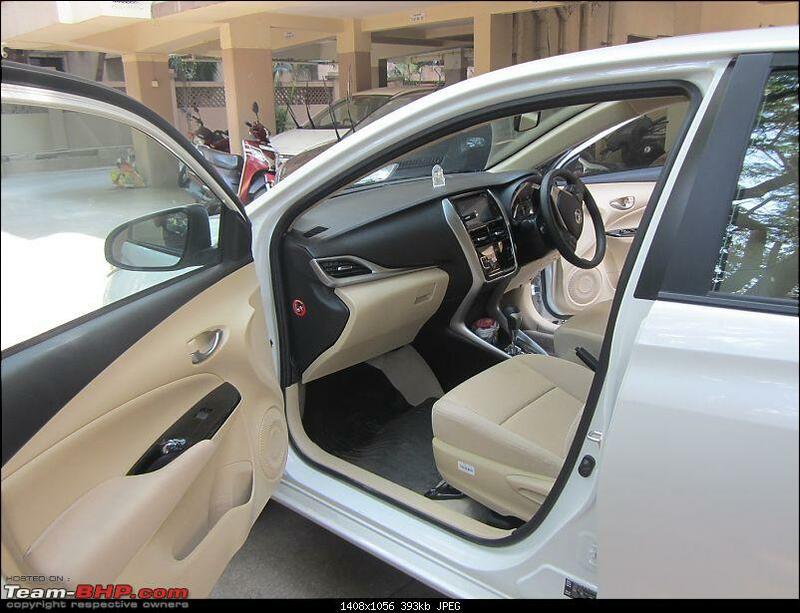 Dimension wise the car is similar to Honda City. 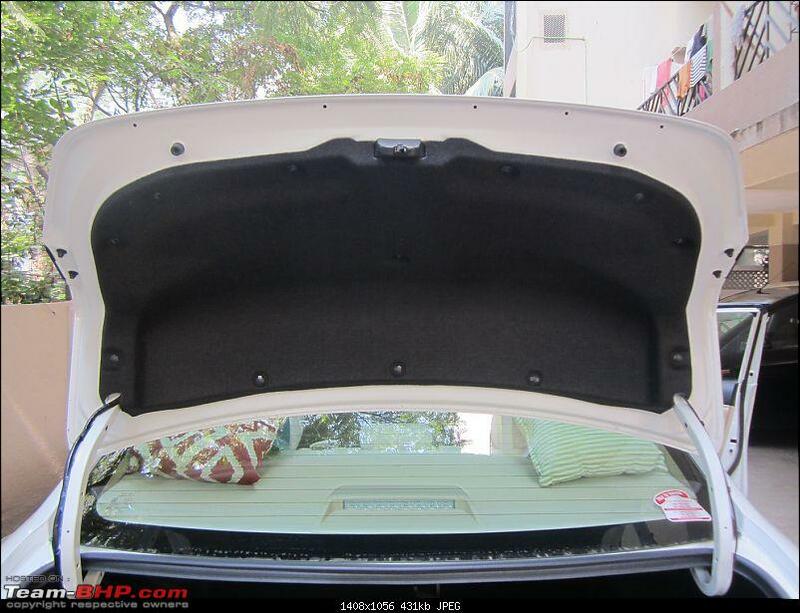 The first time we sat in the car, wife felt that the rear space was less compared to Honda City. So we did a back to back comparison of space by doing test drive of Yaris and City on same day. There was not much difference in rear space legroom or headroom between the two. I have seen so many reviews stating that the rear space of Yaris is inadequate. I am 5' 7" and found the space adequate. My friend 5' 8" and owning 3rd Gen Honda City found head room and rear bench space better than his City. Another friend 5' 5" and owning 4th Gen face-lifted Honda City also found the space sufficient. 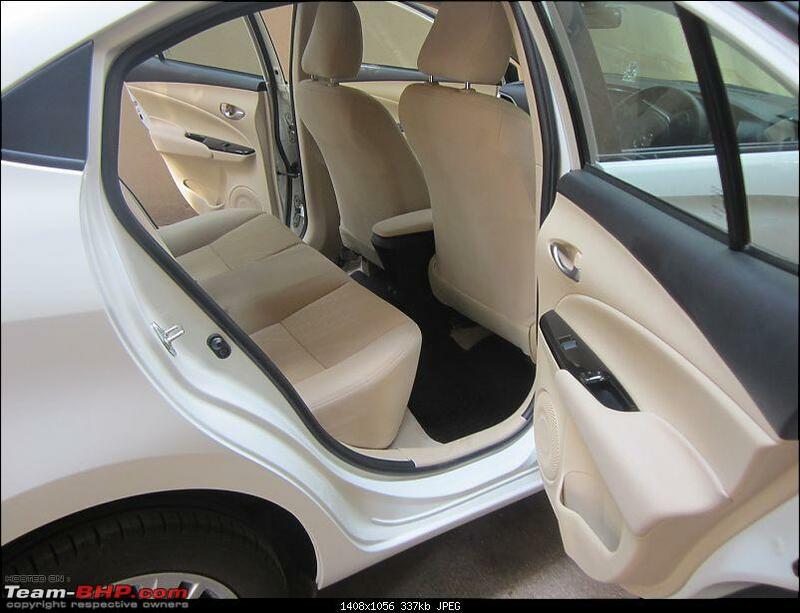 I am not trying to sell Yaris here but would like people not to go blindly with reviews but check the space out themselves along with their family members who will mainly be traveling in their car. The NVH in Yaris is very good compared to Honda City and it effectively cuts out the traffic noise. It was again a tough choice between G and V variant. J variant was ruled out by wife and hence I had to take a call between G and V. Also note that J variant does not come with Acoustic and Vibration control glass. Considering Rear Disc Brakes on all 4 wheels along with Alloy wheels and Front Parking sensors, I tilted towards V variant and it was only slightly above my budget of Rs.15 lakhs. I would have preferred to go with VX variant as it had vehicle stability control but was way beyond my budget. 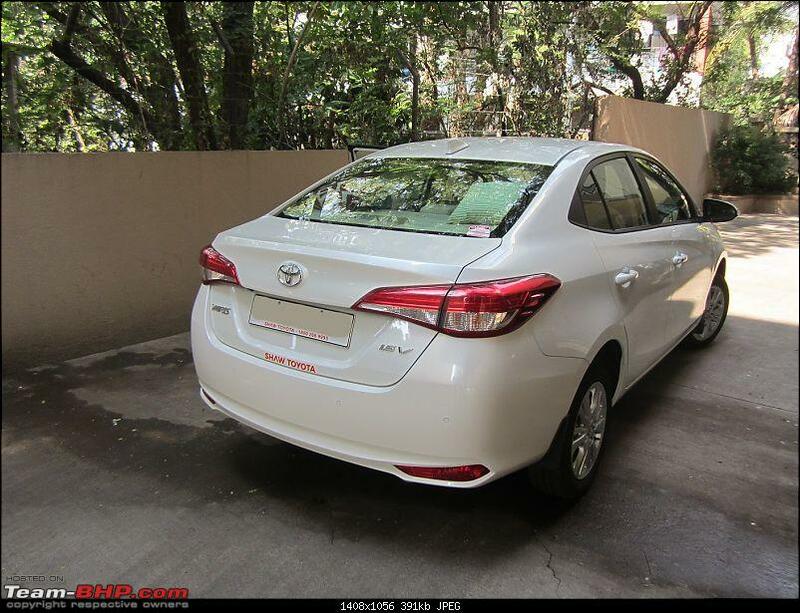 When we were looking for buying Yaris, we had 2 dealers in Pune - Sharayu and Shaw (We also have K Kothari now). 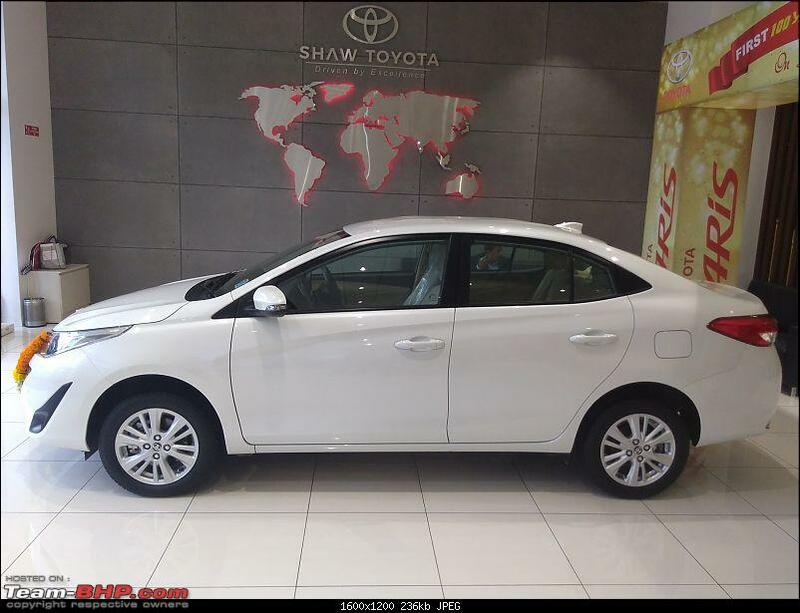 Our experience with Shaw Toyota during test drives was good, also they had their workshop near to our place and hence for booking and purchase, we decided to proceed with them. Initial booking experience was not good but they did make it up by providing a good delivery experience. I was also allowed to do PDI in their workshop before going ahead with registration formalities. The delivery was provided on the date and time we requested. They had arranged for a small ceremony (unveiling the car and a pooja). The whole delivery experience was good. 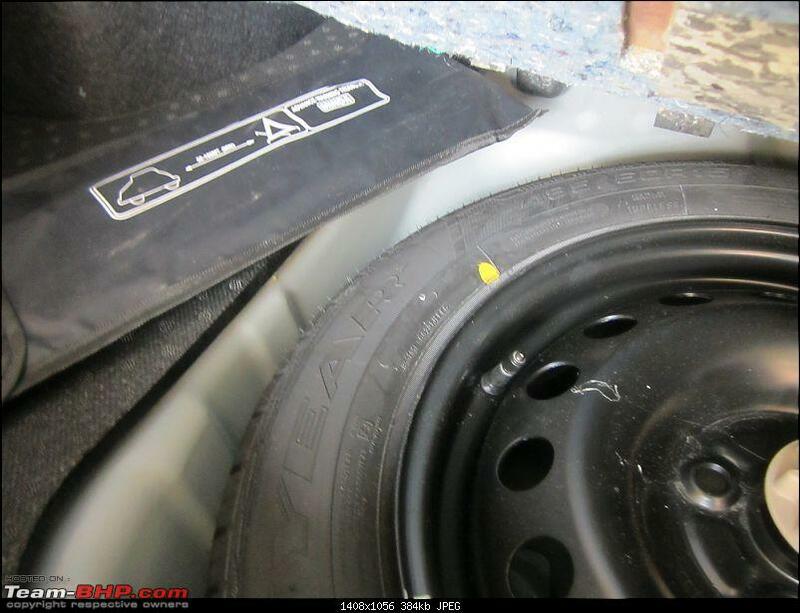 There were no discounts offered except for few freebies related to mud guard and floor mat (excluding trunk). Yaris comes with 3 year warranty. Since I opted for CVT variant, I went in for an extended warranty for 4th and 5th year. The dealer was also ready to match the insurance quote, which helped me save few bucks. 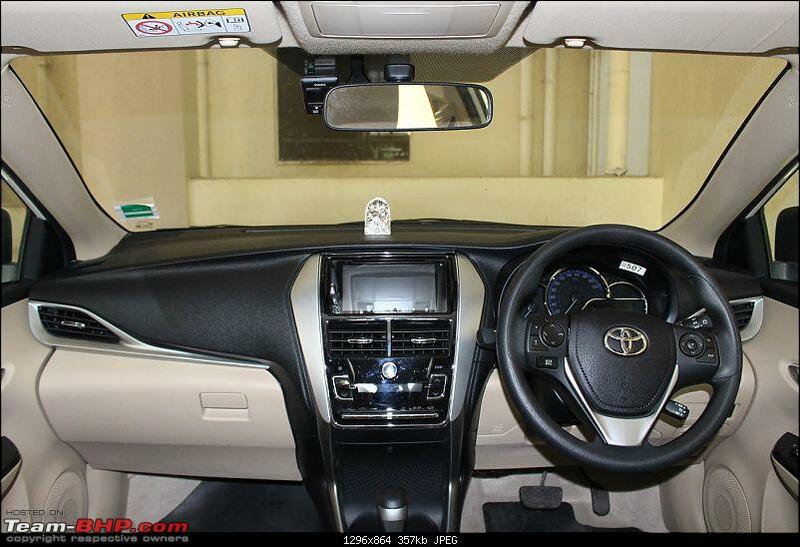 Overall I would rate Shaw Toyota 4 out of 5 with some scope for improvement. However, what amazed me was that there was no call directly from Toyota on purchase of vehicle and asking for feedback till date. Maybe I had too much expectation from Toyota brand. But overall, I would rate experience with Hyundai and their dealers better than that of Toyota. Last edited by Simhi : 30th November 2018 at 07:37. The official review has covered this section in much detail. Some writeup with supporting snaps from my end. All the cars I owned till now (Santro and i10) were not the best looking cars in their categories. However, to be frank, I still love the looks of Honda city for its arrow shot design. Having said that, Yaris looks are not something which will make people turn their heads. Yaris front looks overdone but I still love the rear and side profile of the car. The styling on rear and side is clean with very less use of chrome. The front parking sensors are useful while parking in tight spots. My parking space is very compact. I find these sensors very helpful as they allow me to park car with just enough space to park 2 wheeler behind it comfortably. 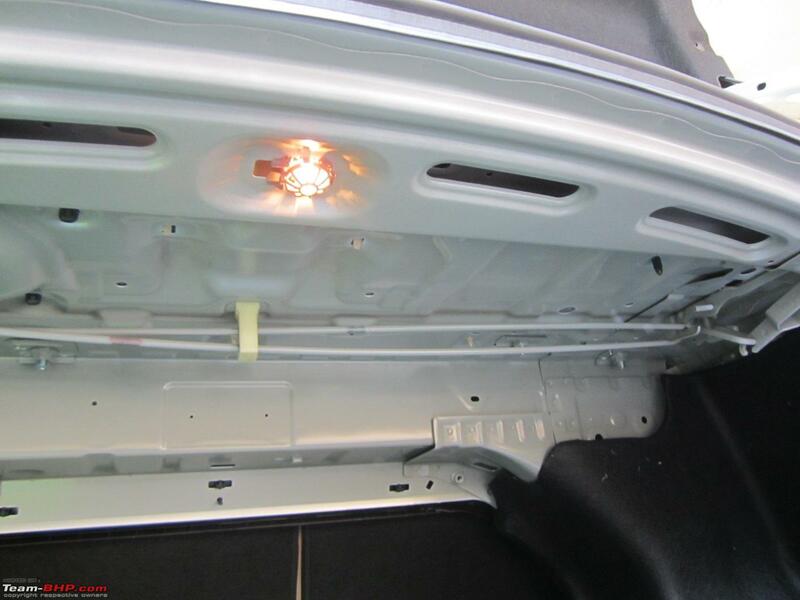 However, the front parking sensors can be annoying in traffic signals and it can keep beeping. Luckily, Toyota has provided a switch to turn it off in such situations. The fog lamps provide sufficient illumination. 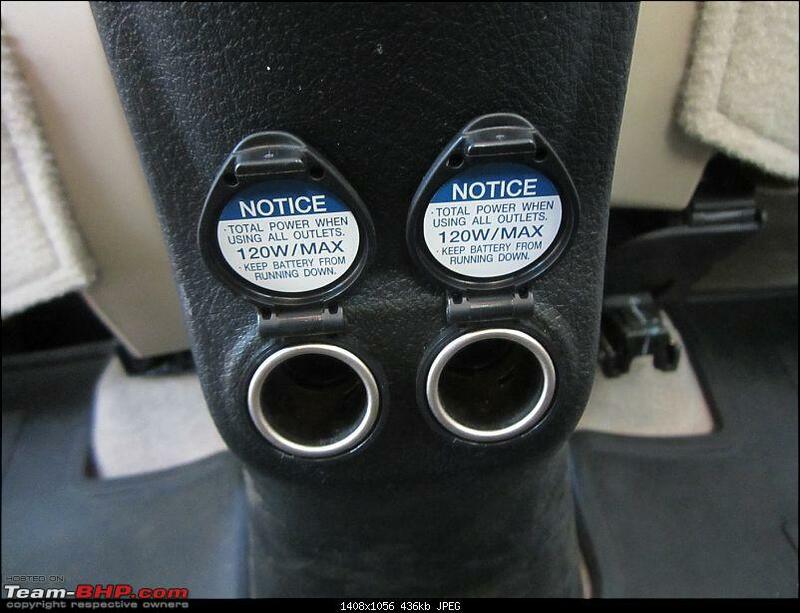 No Traction control switch in V variant. 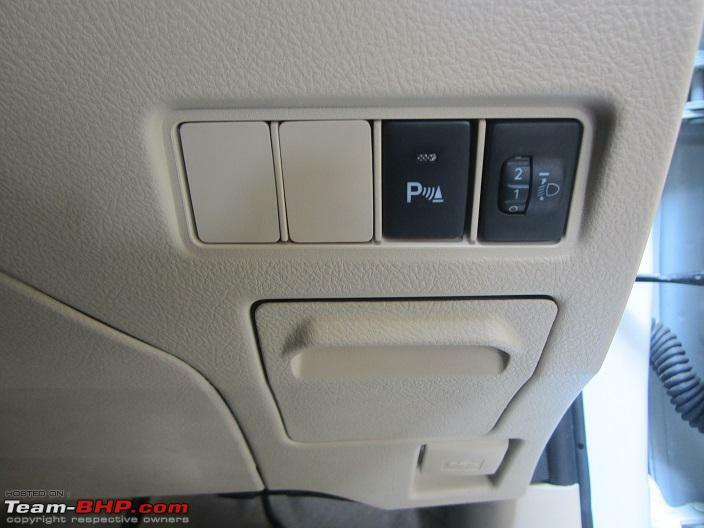 Storage compartment and bonnet release button are also seen below the parking sensor switch. The paint and build quality is excellent. Panel gaps are uniform. The doors feel solid and shut nicely. 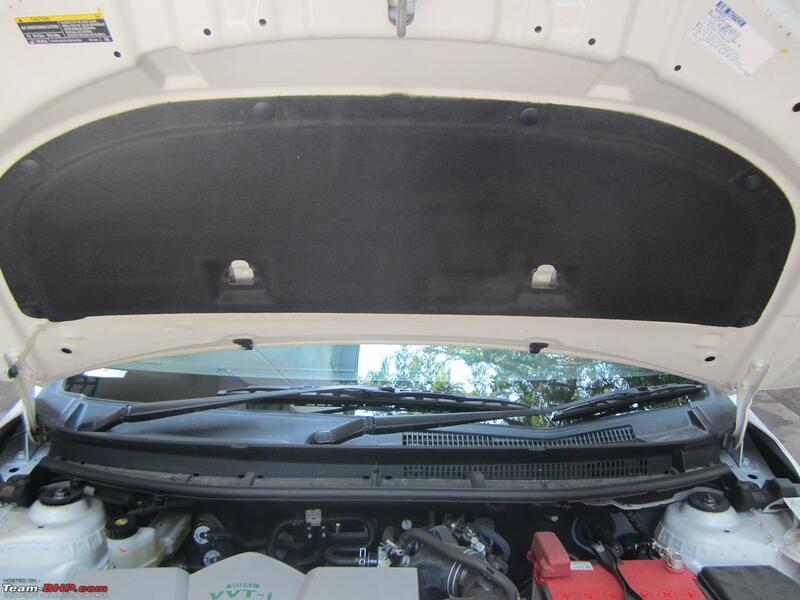 The bonnet is on the heavier side and has padding. The ORVMs are electrically foldable and adjustable. The rain sensing wipers are super silent during operation and automatically change their speed as per rain. In i10, if I remember right, there were only two settings for wiper (slow and fast) and I always missed one additional setting. However, rain sensing wipers can be annoying sometimes as they wipe the screen even when there is only slight drizzle and very few rain drops. I prefer to shift to manual mode during light drizzle. Automatic headlamp is a boon especially when driving through tunnels. Headlamps seems effective within city driving. I am yet to test their effectiveness on highway. 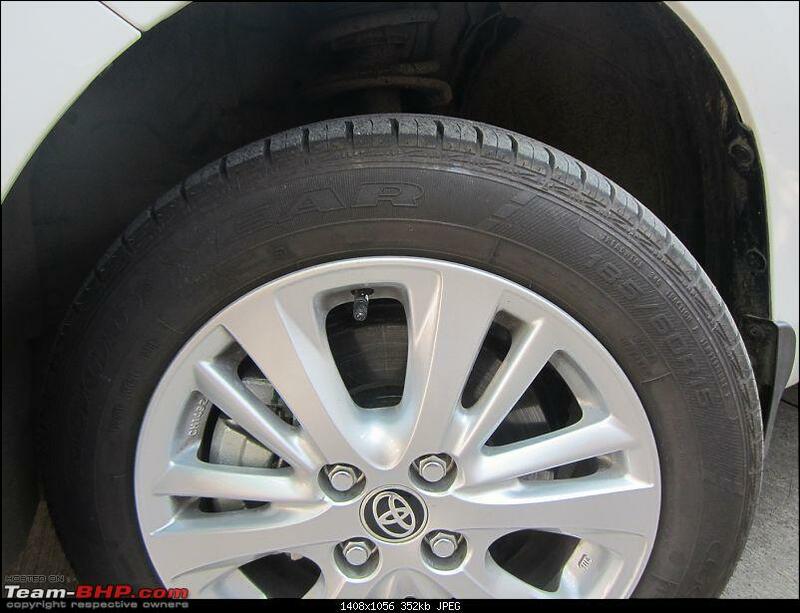 Disc brakes on all four wheels are confidence inspiring especially when driving on a highway. 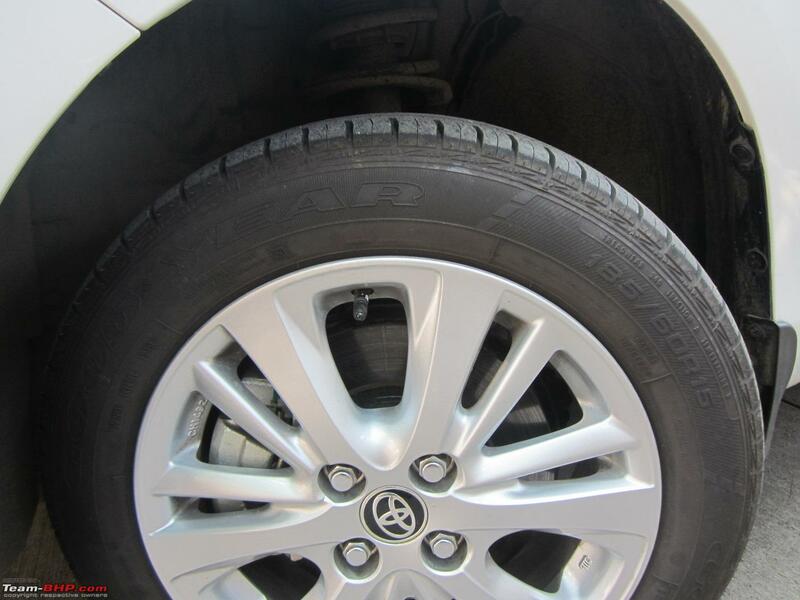 15inch alloy wheels with Goodyear tyres. 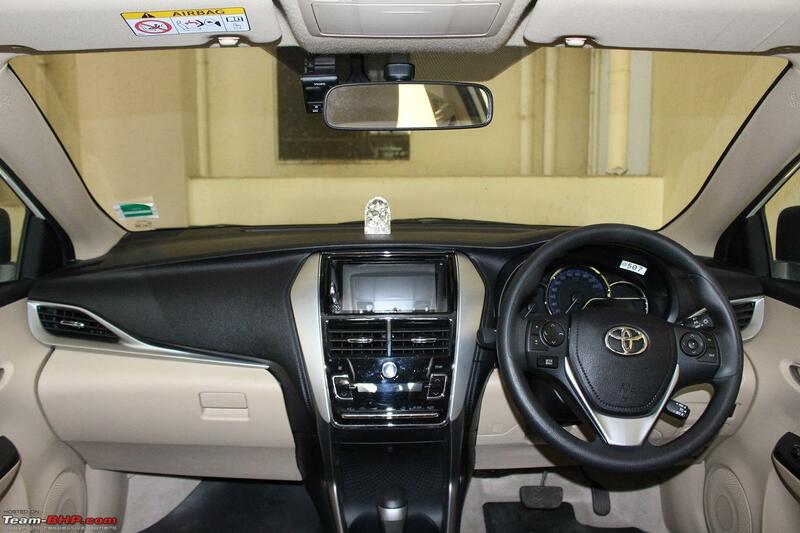 Unlike some cars, Toyota has provided both reversing camera and four parking sensors. I am still used to reversing using parking sensors and mirrors and not using reversing camera much. Touch based boot release button is provided. The doors open wide enough and getting in and out is easy. There is sufficient legroom and headroom both in front and rear. We can notice the absence of pocket at rear of the front seat. We had this as part of fabric cover in i10 and found them very useful. The front and rear windows are large enough. They provide sufficient illumination thereby giving a spacious feeling. You do not get claustrophobic feeling while sitting in the rear. The dashboard is well laid out and screwed well. During recent trip to Kolhapur, car had to bear the brunt of many rumble strips. Luckily, post the trip, there has been no rattling sound of any kind from the dashboard or anywhere else. All buttons are well laid out. No issue with ergonomics. Manual seat height adjustment is provided in 'V' variant. 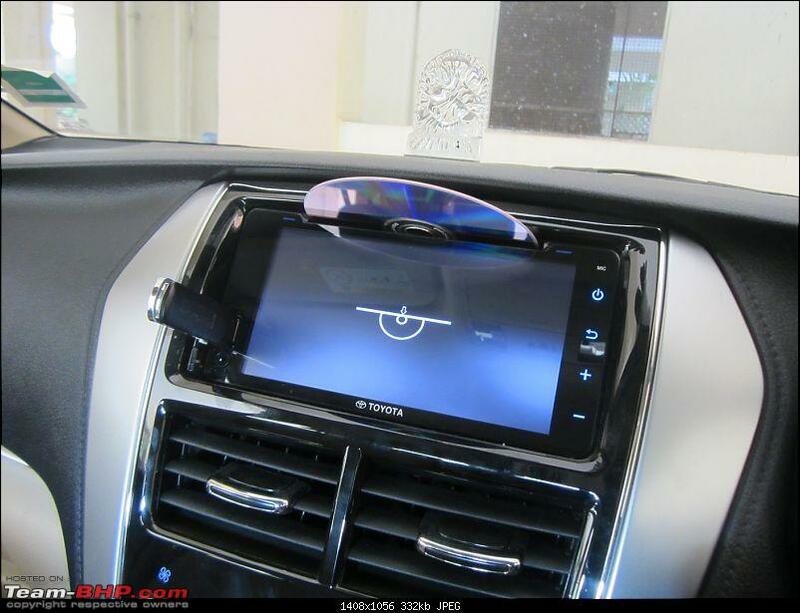 Also seen is the VIOFO dashcam accessory next to rain sensor. Visibility is excellent from the drivers's seat. The A pillar does not hinder visibility during turnings too. 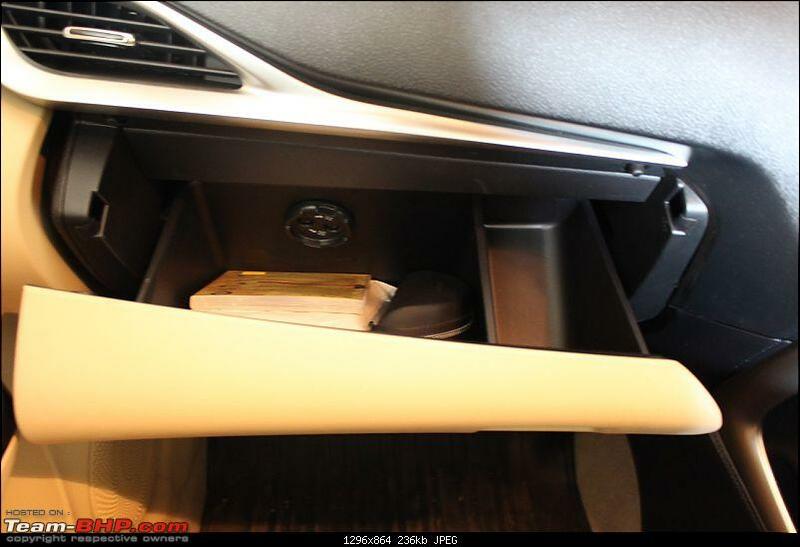 I especially like the center console, which has buttons instead of touch for air conditioning controls. Steering wheel in "V" variant. It is nice to hold. 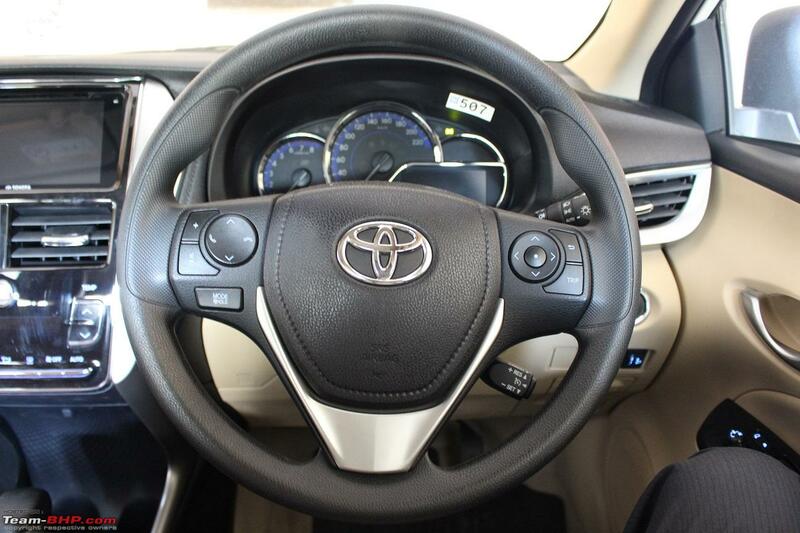 Unlike i10, I found using the horn in Yaris difficult as you need to lift your hand slightly to press the horn. i10 did not have the steering mounted controls and am getting used to them in Yaris. Mainly using the audio controls to switch tracks or adjust volume. Tested cruise controls once but have not used them since then (even on highways). 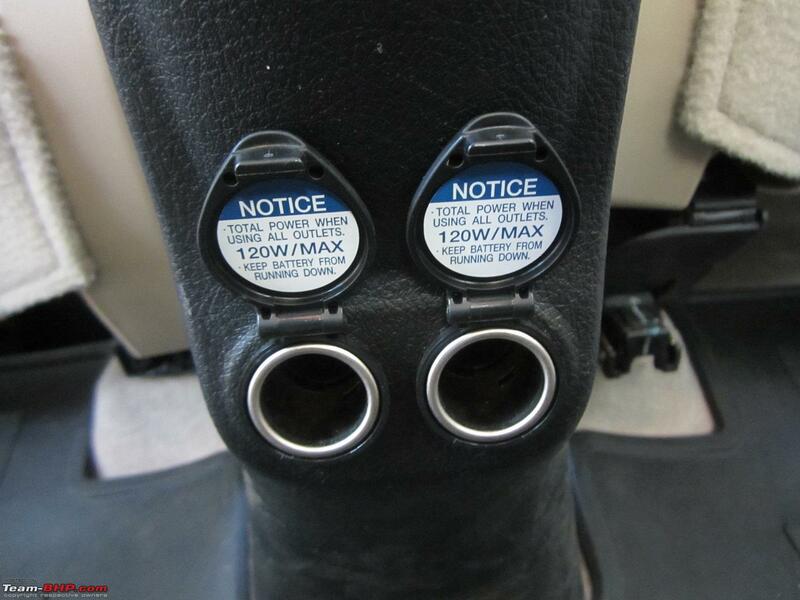 The MID is easy to read and provides all required information. Snap from a recent trip. 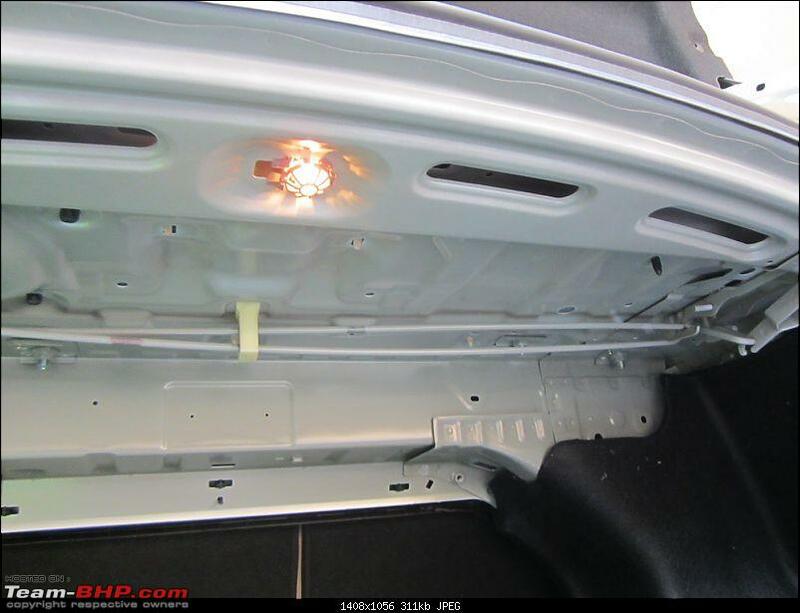 The glovebox has sufficient space but have not tested the cooling feature yet. 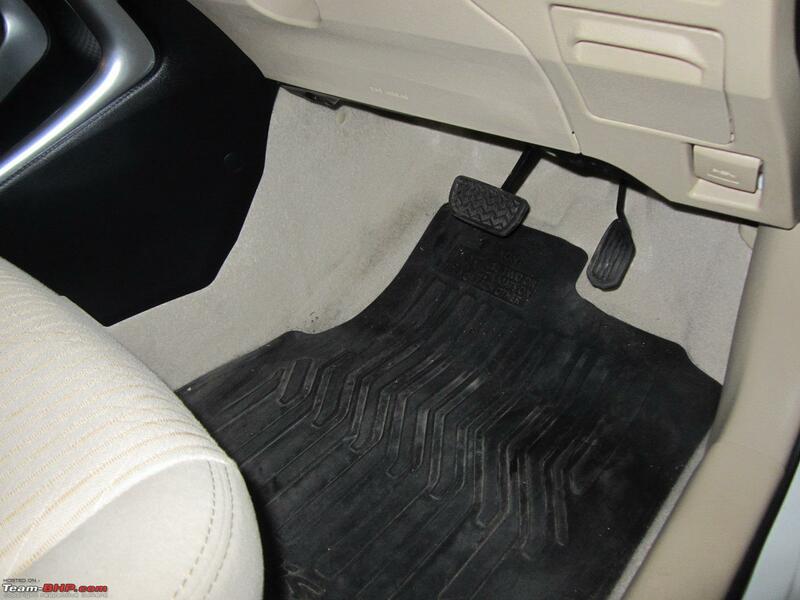 As rightly pointed out in the official review, the lower part of the dashboard is beige and so are the carpets, making them prone to getting soiled. 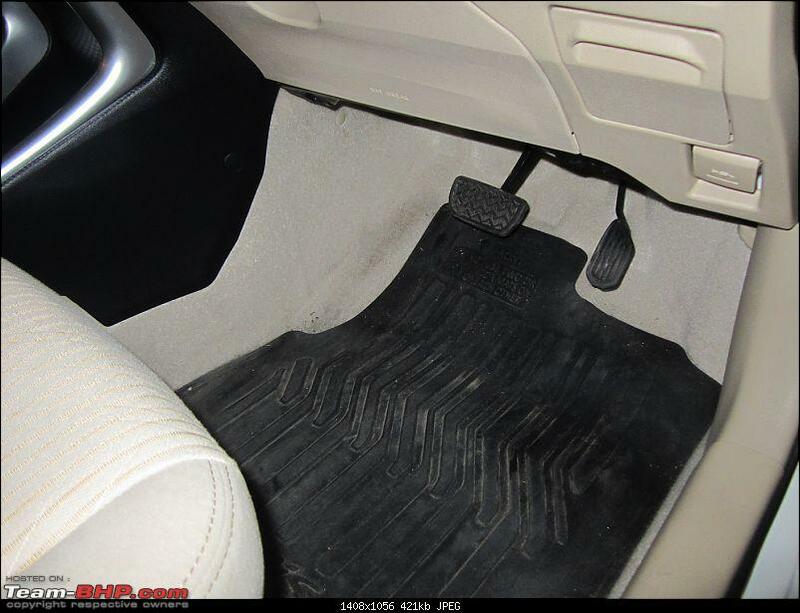 The floor mats do not cover the complete area and thus do not help. 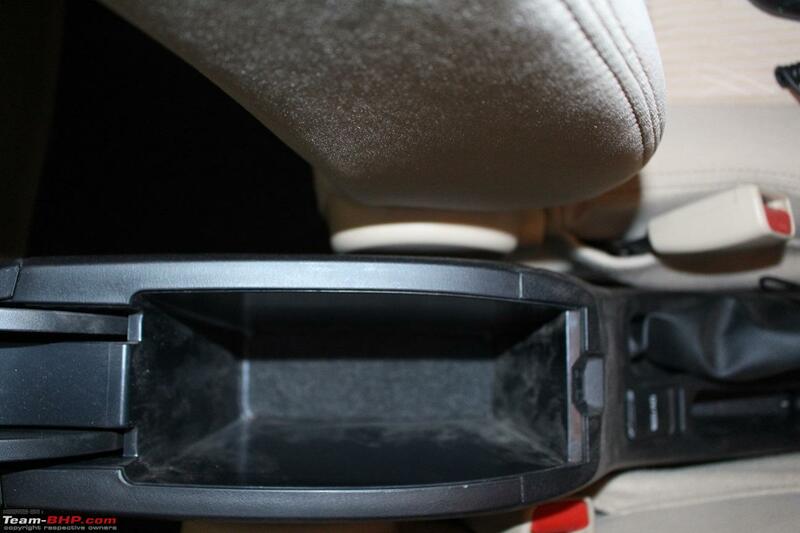 Notice the absence of dead pedal and the area for dead pedal becoming dirty. 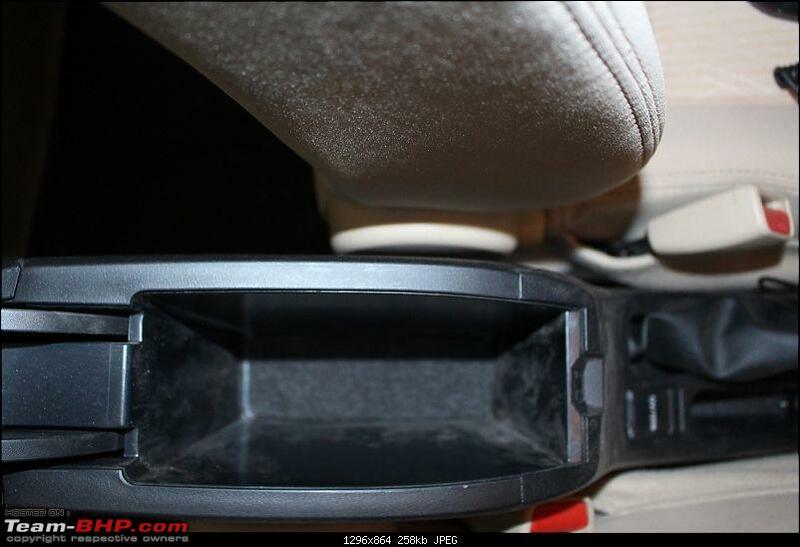 Also seen is the location of driver's knee airbag. Power window console has all required buttons for window up and down, window lock , doors lock/ un-lock etc. However, unlike i10, not all buttons get illuminated at night. Not sure about the logic behind this. 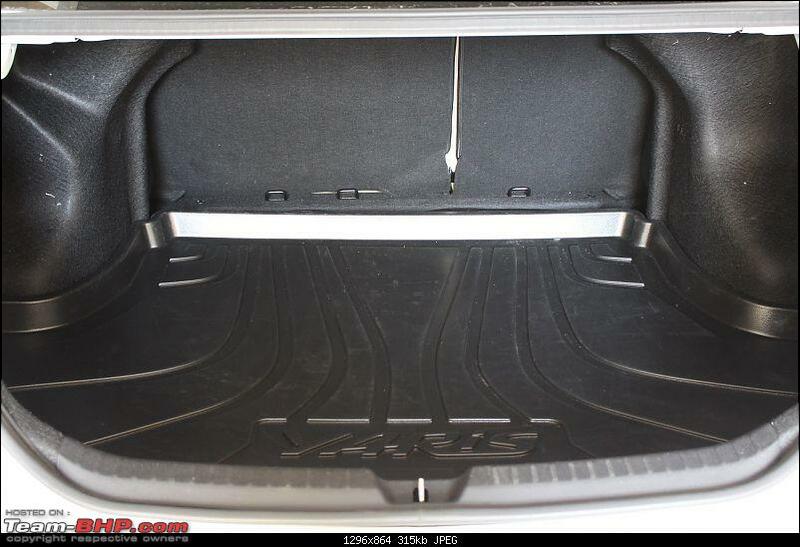 There is sufficient space for storing bottles in all the four doors. For reference, we can keep up to 750ml Tupperware bottle. 1L Tupperware bottle does not fit. 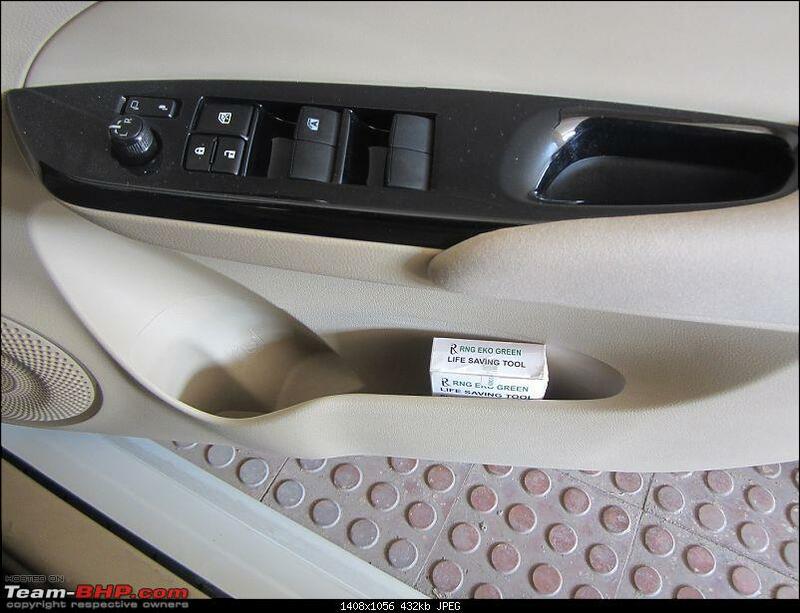 Also seen in the picture is the life saving tool for cutting seat belt and breaking glass. 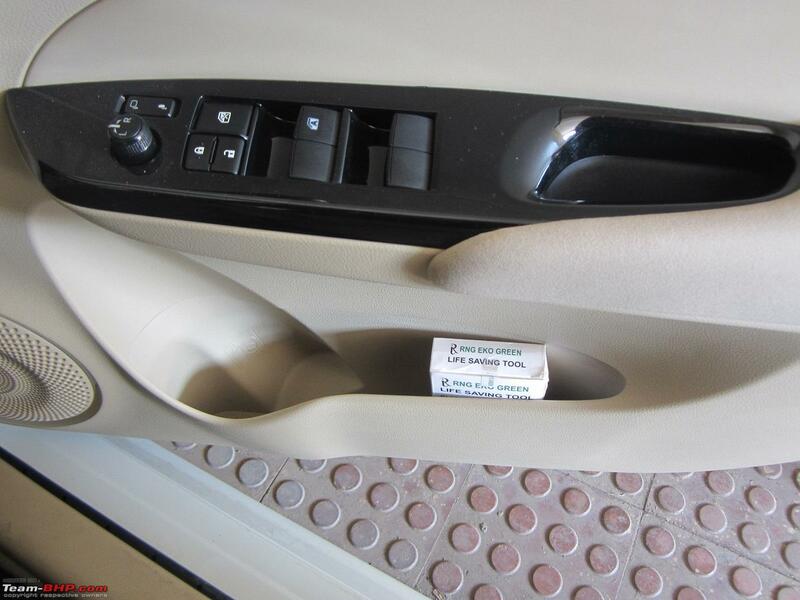 Arm rest console serves as storage space only. 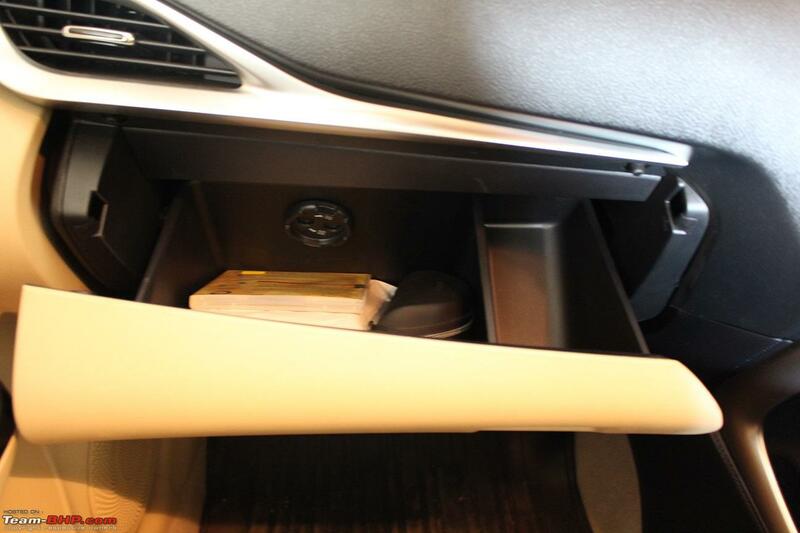 The storage space is good enough to keep things like mobile charger, keys, etc. 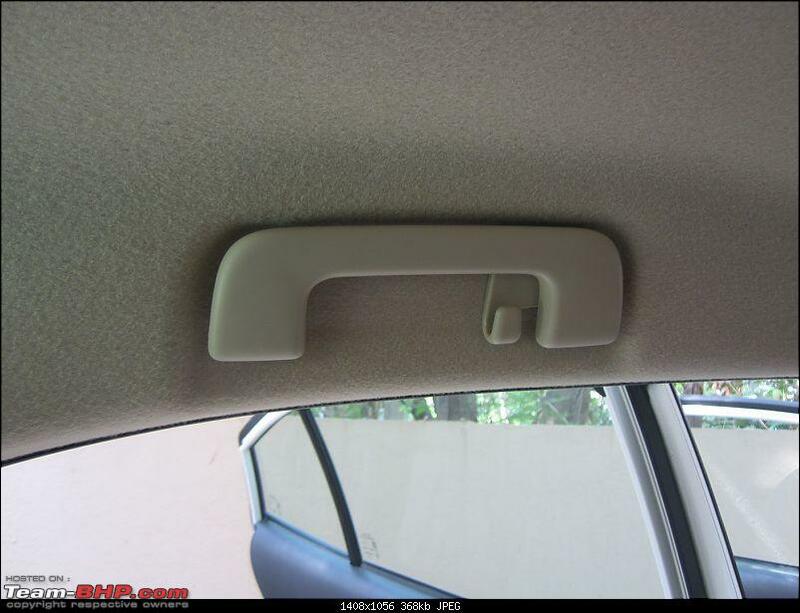 I used to get irritated when kids used to mess around with i10 grab handles and it used to make a thud noise. 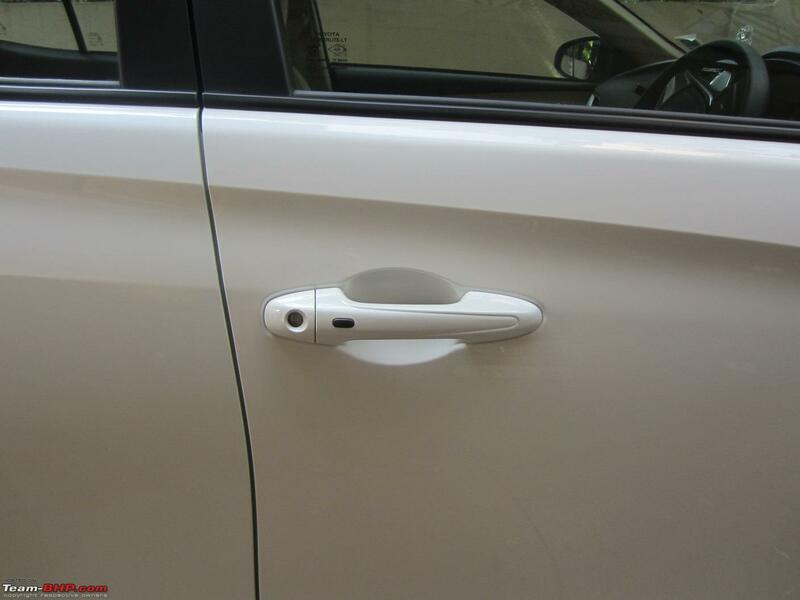 Yaris gets a spring-loaded grab handle, which closes slowly and silently. Roof mounted air vents have not been used much. The front blower is sufficient to circulate the air throughout the cabin. Also, the vent blower noise can be annoying above level 1. 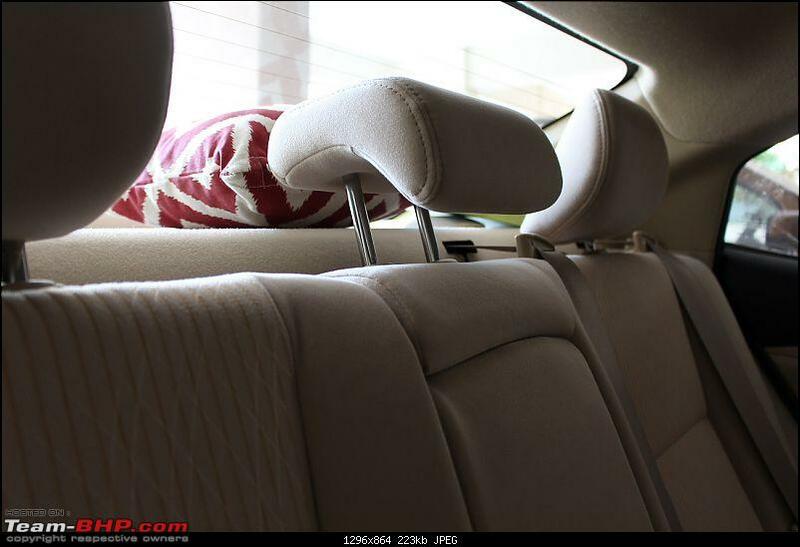 We get three headrest at the rear and all of them are adjustable. I will not delve into ICE as we are used to only listening only songs from USB drive and that works fine. We hardly use other features like CD, Bluetooth connectivity, radio etc. One thing I noted was that we can play even video (tried mp4 format) in the entertainment system while the car is at rest. The video is switched off (not audio) when car moves with a cautionary message. 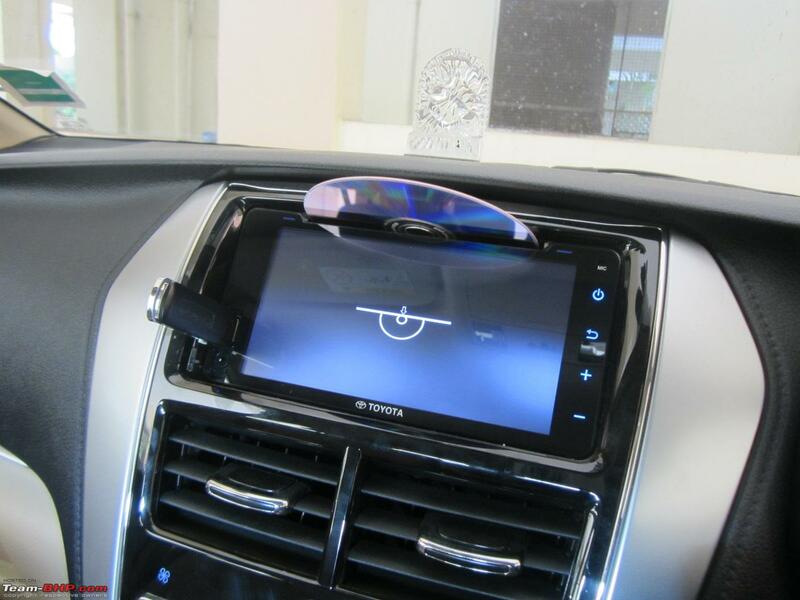 Unlike VX variant, there is no need to tilt the touchscreen unit to insert CD. 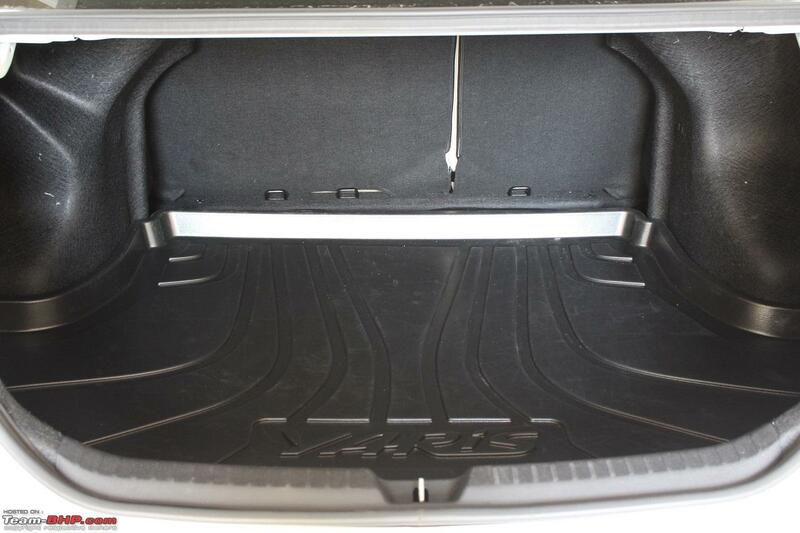 The bootspace at 476L is sufficient enough to carry luggage for four. The boot gets illuminated too. The Luggage Tray accessory is of good quality. 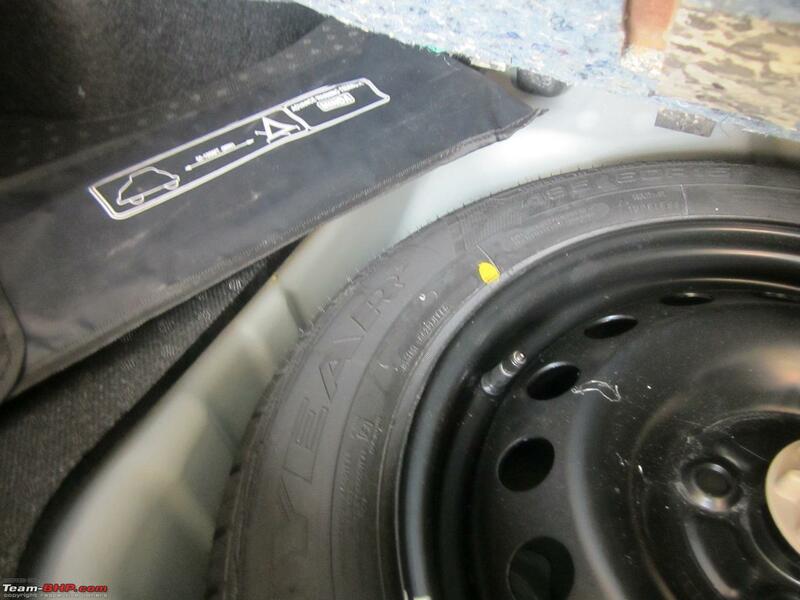 One good feature provided by Toyota is that we can just lift the carpet and cardboard cover to fill air into the spare tyre. In i10, the valve used to be on the down side and we had to remove the nut and turn the wheel upside down to fill the air. A well thought out design feature by Toyota. 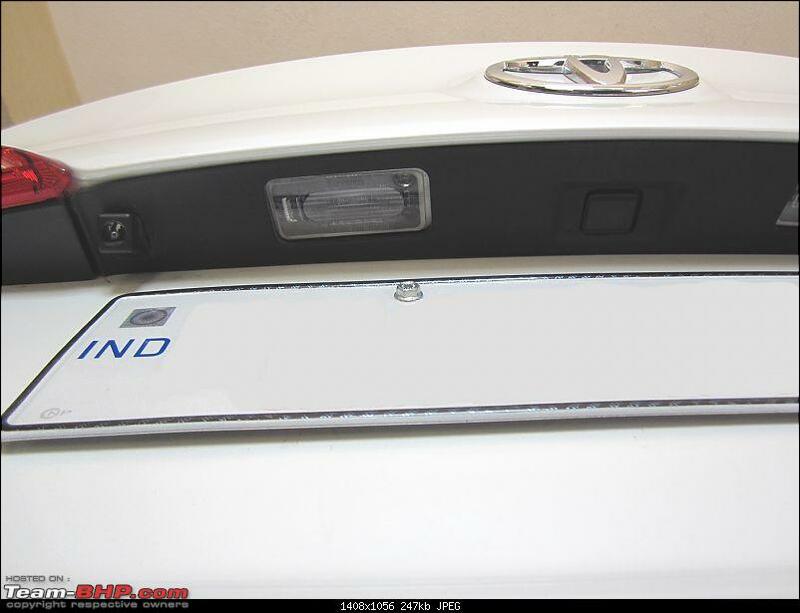 One niggle for me right now is the rear reading/cabin lamp. It switches on as soon as you open the doors. The cabin lamp can stay on (in one setting) even if you have switched off the car and locked it from outside. If it stays on, you need to open the car, press the button to switch off again and try again locking the car and ensure that the lamp stays off. I would have expected the cabin lamp to switch off automatically once the car is switched off and locked. 1. 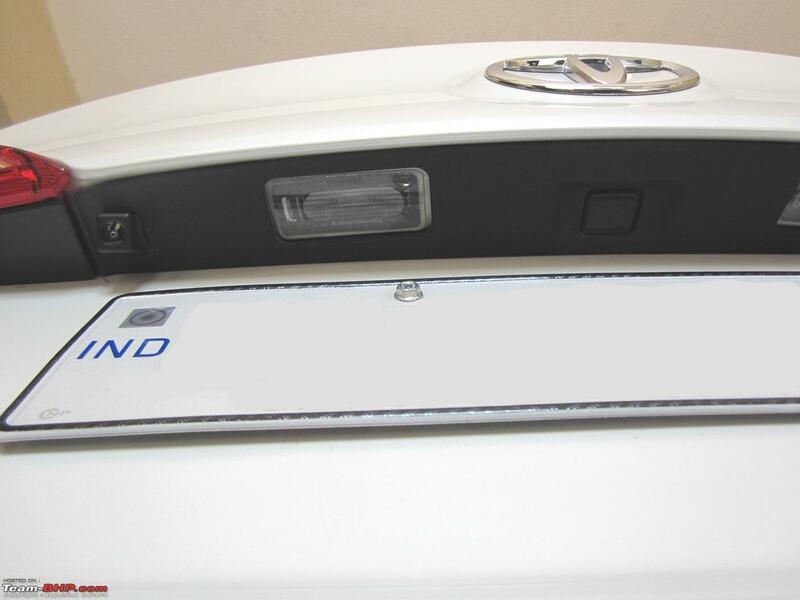 Bought Luggage Tray accessory from Dealer. 3. Bought Resqtech 8 Litre manual washer. Along with Jopasu Duster and Amazon Basics micro-fibre cloths, it helps me keep the car clean. Last edited by Simhi : 2nd December 2018 at 07:41. Ride comfort - I won't be able to explain this in technical terms. In i10, there was not a single long trip where my kids had not vomitted particularly in a ghat section. However, since we bought Yaris, 50% of the drive has been on highway including ghat section and kids have not vomitted a single time. The suspension and ride quality at both low and high speed is good compared to i10. Handling at high speeds is also good. I feel more confident compared to i10 in taking corners. 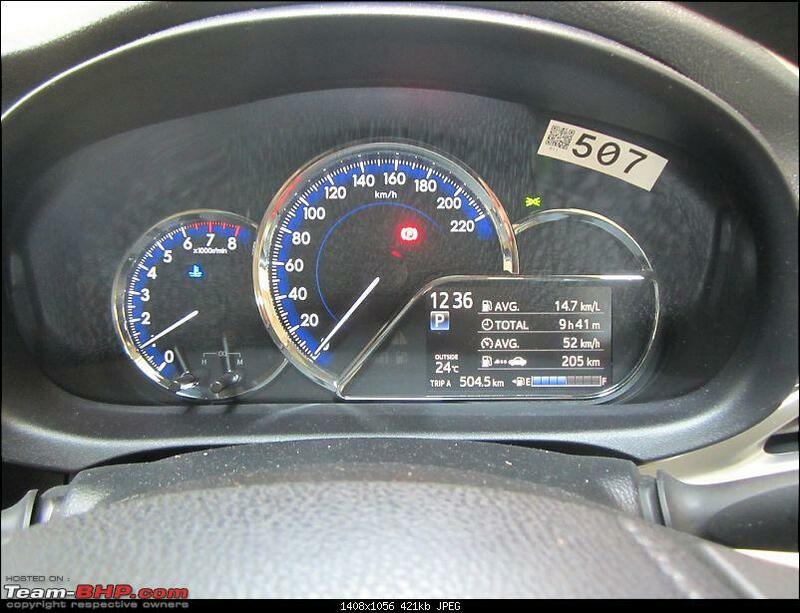 I used to not feel confident driving i10 beyond 80km/hr but with Yaris you feel confident even at 100km/hr. In a recent trip from Kolhapur to Pune, I could maintain triple digits in highway and Yaris had no issues cruising at such high speeds. I never had to floor the pedal to gain speed. Maybe my last 8 years experience of driving i10 automatic (TC unit) helped in quickly adapting to CVT. The CVT is effortless and pleasure to drive in both City and Highways. I never felt the need to use 'M' mode and always used the 'D' mode. 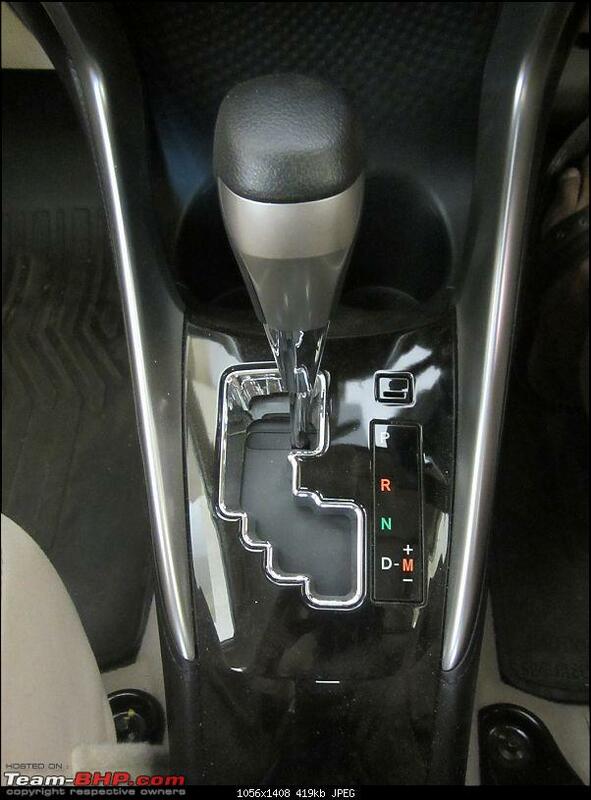 The 1.5L Dual VVT-i engine has sufficient power even with AC ON at all times. 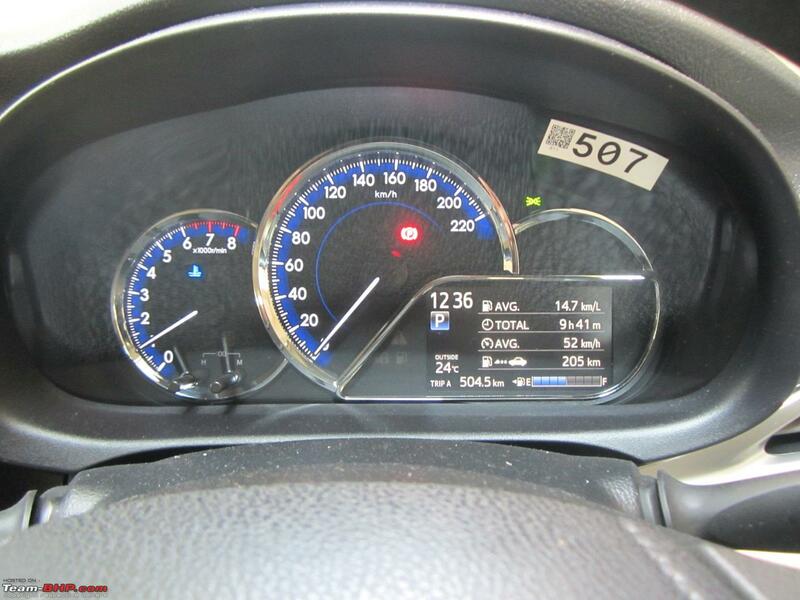 In i10, there were times where I used to switch off AC to gain power for overtaking or picking up speed. Till now, I have not felt the need to do the same with Yaris CVT. Overall, I am happy with the engine performance. All disc brakes provides lot of confidence while driving on highway. In recent trip, I had to apply sudden brake and the vehicle maintained straight line and came to halt in short distance. 7 airbags + ABS + EBD + BA + All Disc Brakes provide confidence to take family on long highway trips. 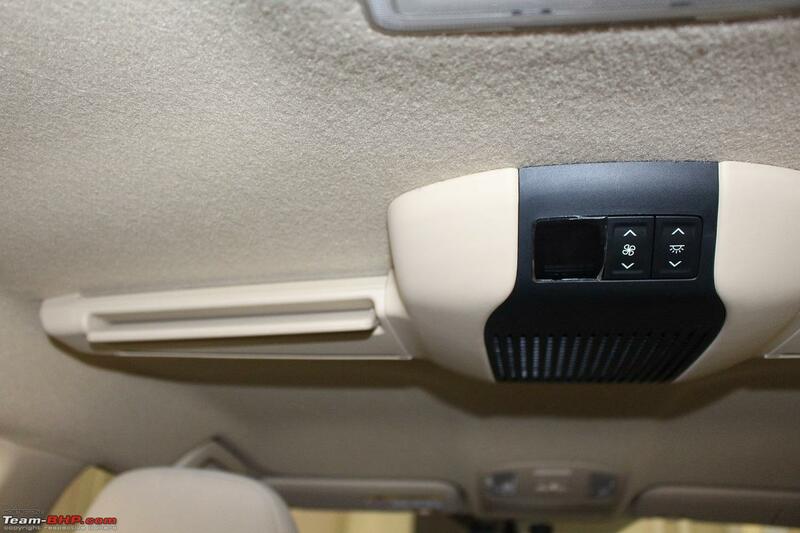 All of us in the family love the sound insulation the vehicle provides and prefer to keep windows up all the time. It has become a sort of addiction to experience a silent cabin cutting off traffic noise. We usually keep the AC around 24 or 25 degrees and everyone is comfortable at this setting. We tried 21/22 degrees few times but the cabin then becomes too chill. All drives with AC ON and temperature kept around 24 degrees. These are still readings from MID and I need to collect more readings to provide fuel efficiency based on tank-to-tank method. On a lighter note, it has occurred twice now wherein the petrol pump attendants confirmed with me multiple times that they need to fill petrol in a Toyota vehicle. This shows how much Toyota is synonymous with Diesel vehicles (all Thanks to Etios, Innova and Fortuner). As per official review, the ground clearance is 152 mm laden, 175 mm unladen. 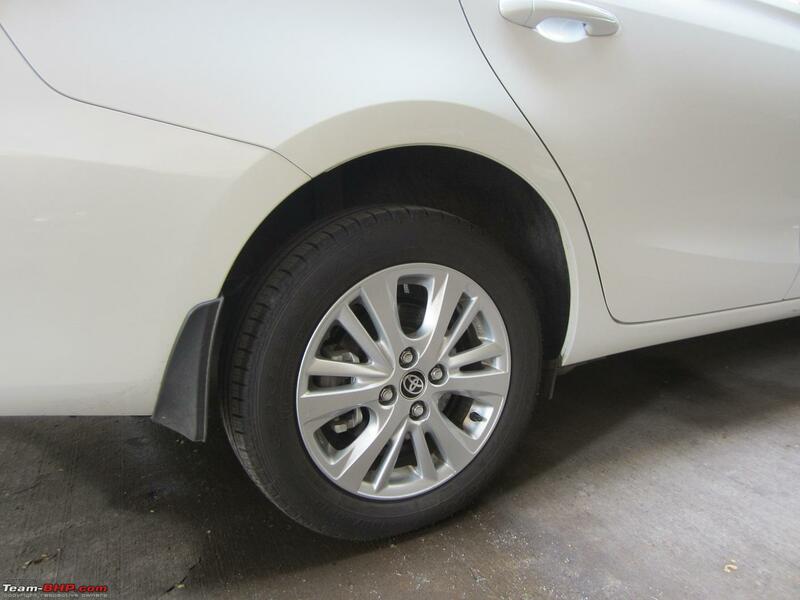 However, till now, have not faced any issue with scrape of undercarriage over any bumps. First service (1 month or 1000kms whichever is earlier) was basically an inspection service. Though on my insistence, the dealer changed the engine oil. The next service is at 1year or 10000kms, whichever is earlier. Most of the people at Shaw Toyota service center seem to be from DSK Toyota and are knowledgeable. The quality of service was good. Last edited by Simhi : 1st December 2018 at 13:06. The Yaris is a car with good safety features (7 airbags + ABS +EBD + BA as standard), solid build quality and Automatic option across all variants. I would strongly recommend Yaris to anyone looking for combination of these features. I hope India made Yaris gets 5 star rating in Global NCAP tests. It is sad to see that the sales figures does not reflect its true potential. As pointed out by many in this forum, high price along with absence of diesel variants has made Yaris register low sales figures. I don't think discounts are going to help revive the sales. Let's see how the sales turn out in the coming months. Last edited by Simhi : 27th November 2018 at 04:53. Thread moved from the Assembly Line to the Initial Ownership Section. Thanks for sharing! Congrats on the Pearl White Yaris, it looks great and kudos on a well written start to an ownership thread, keep us updated. I've a 1.5 yr old Honda City VX CVT and would have considered the Yaris if it were available then. That said I haven't TDed the Yaris. 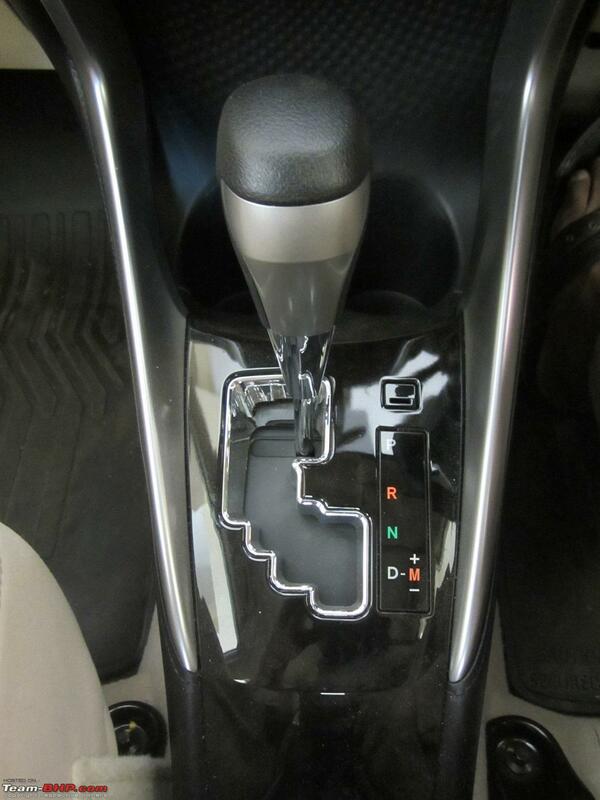 CVT is a boon in city traffic and on the highways. 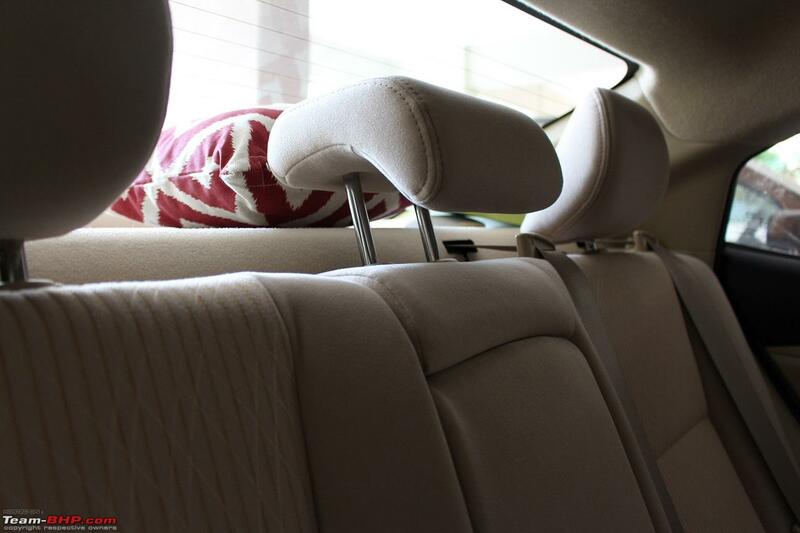 BTW your kids motion sickness on ghat sections has nothing to do with the car. Agreed, after living with the City for 1.5 years, I find NVH a little wanting especially on broken roads, it's perfect on well paved ones but on broken roads there's a lot of tyre noise and have to turn up the volume of the music to keep things pleasant. But stepping on the gas leaves a huge grin on my face. I've been getting 8-9 kmpl in the City and 14-16 kmpl on the highway. Even I have a liking for 'underdogs' they come with some great deals, my previous car was a petrol Elantra GLS that came at a ₹1 Lakh discount and I just loved it. I still have it as a beat car. Last edited by Durango Dude : 3rd December 2018 at 08:16. Congrats on the Yaris. I believe it is sensible car and it will undoubtedly serve you trouble free for years to come. I test drove the Yaris and simply loved the brakes. I was not happy with the price and few things here and there so I let it go. I sometimes still wish I had bought this instead of the Verna D. As far as the dead pedal if you see the bit soiled section at the left side that part is the foot rest and is supposed to be used as a dead pedal. This part is not available in the manual and was one of the big let downs for me. Congratulations and thanks for sharing. It is definitely surprising that the sales are as low as it is. Definitely a well loaded car with a good focus on safety. 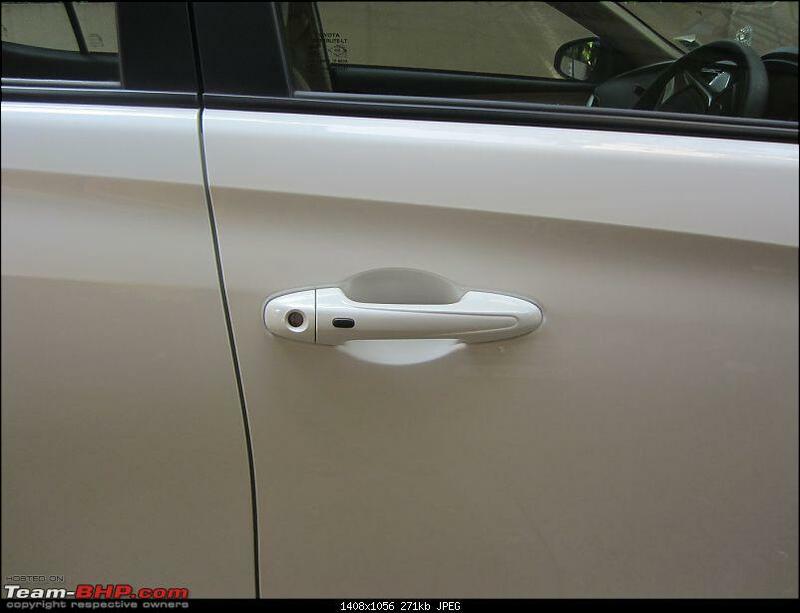 Had not noticed that the Yaris had front parking sensors also. 7 Airbags, All 4 Discs, CVT-All across all the variants. All other parameters are also not far off from what the competition offers. One would think it should easily average at least 2-3000 copies a month. Pricing is of course one reason called out for the poor sales. 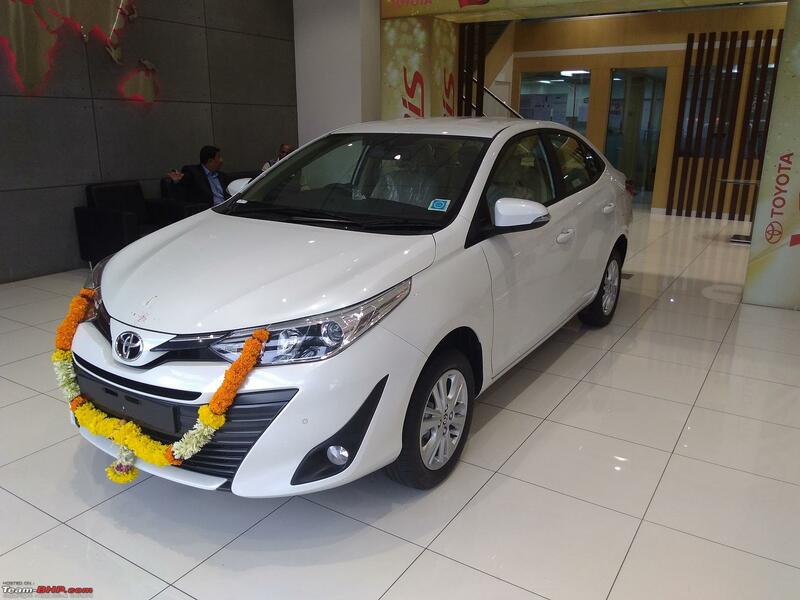 Considering all the cars in the segment are over priced and with Toyota's reliability and background, one would have thought the price would not be a deal breaker. Toyota must be scratching their head in surprise. 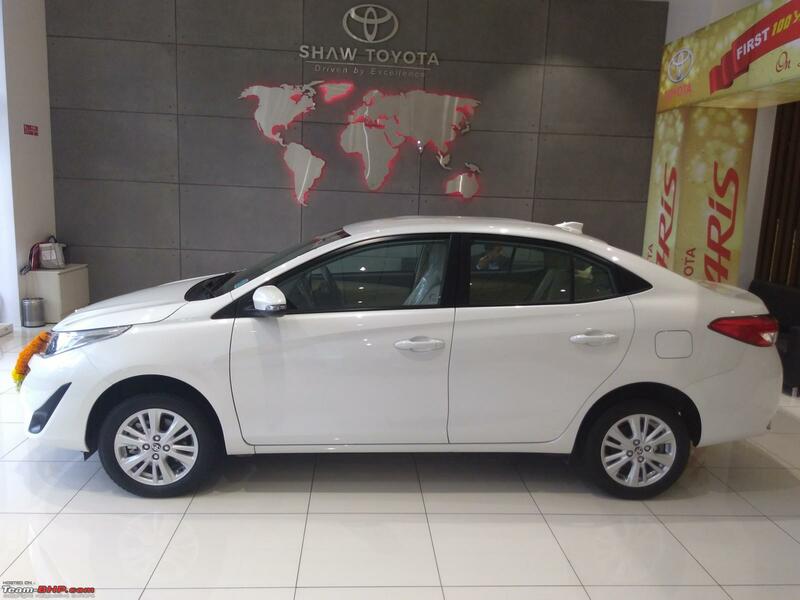 Thanks for sharing your ownership experience Simhi, and especially for the Shaw Toyota information. Very useful for us Punekars who have been left bereft by DSK! A question for you: do you have to visit the old city (Peth) areas often, and if yes, was your adjustment period a tough one as far as parking a longer car compared to your i10 is concerned? Congratulations for your new ride and wish you happy motoring for many years to come! 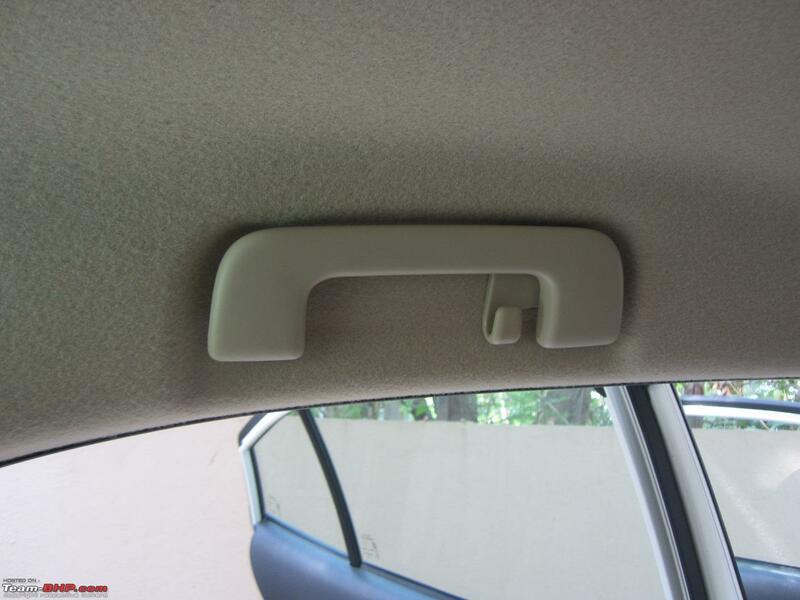 Can you please share your views about front seat height as compared to say Honda City. Nice review. I believe it is one of the first yaris’s on Team Bhp. The car was inconspicuous by its sales numbers which were downright pathetic. The Toyota badge couldn’t help it either. But I must say it’s a sensible buy and one can easily trust this steed if the priority is on safety. Having said that since the pricing is dangerously close to the creta, the creta by popular vote moves off the shelf rapidly. BTW I am surprised to see the mileage on your I10 although you did emphasize on city driving but then 21K is awfully low for a car in your garage for close to 8 years. Happy munching miles!!! Drive safe. The Yaris is indeed a looker for the true connoisseur. All times are GMT +5.5. The time now is 04:11.